People keep asking me what my favorite part of our vacation was, and I’ve been lying every single time. I do have other favorite parts, but I’ve been keeping my very favorite to myself. Partly because it was a moment I had, not a ‘thing’ I saw. Partly because I don’t particularly care to discuss politics with just anybody and everybody, and nearly everything about Washington D.C. traces back around to politics. But mostly because the moment was so powerful, so emotional for me that the first time I tried to tell somebody about it, I had to stop myself from crying, and I don’t intend to repeat that in every casual conversation I have. My favorite moment of this entire past week, maybe even the past year, happened in the National Portrait Gallery. It’s an amazing art museum. I am continually in awe of the power of a portrait. The Presidential section is just spectacular. (I think they have an app should you want to peruse it without actually going there.) After you circle through the Presidential gallery, you come out into a foyer of sorts where there’s a set of staircases to go down to the other floors. In this hallway is where the large portraits of President Obama that you see in the picture above are located. When I came out into that foyer, I saw a young man, about 11 or 12, take his place in the middle of those two photos. His mom was close by with the camera, taking a ton of shots, and there was a small line of other parents and kids behind her. All black Americans, all waiting to capture this moment in history, this promise for the future with their kids. The beauty of that moment took my breath away. I don’t often speak about my voting habits (unless it’s to the 8000 pollsters that continually call our house), but to be a part of this moment in time, to watch those young men smiling beside the portraits of this man who represents a true change in our culture and our nation, to know that my very own daughter has one more barrier knocked down for her future…I have never been more moved and proud to be alive at this particular time in history. This isn’t about politics for me, and I sense that it’s not about politics for all of those families in line either. This is about progress and freedom and change and hope. I wonder if this is just a small taste of what it felt like to be alive during the civil rights era, to see and take part in changing the very structures of our society in the name of freedom and equality. My very favorite photo ever taken of our President is the one below. It moves to tears every time I see it. 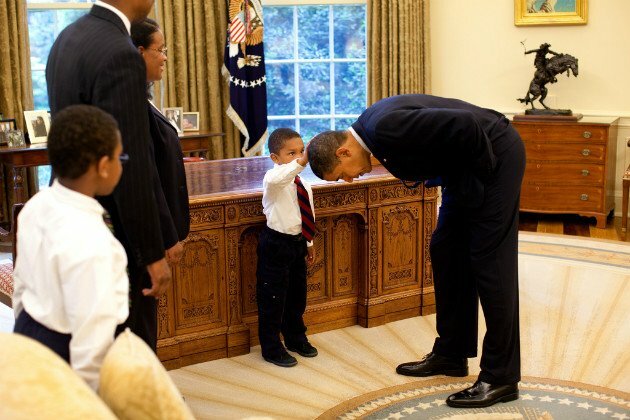 For one of the most powerful leaders in the world to bend down to a child, just to say, “hey, my hair is like your hair. You’re just like me.” That photo evokes every feeling that I felt in this moment in the portrait gallery as well. That young man whom I saw standing before those portraits in our nation’s capitol now can believe his parents when they say he can be anything given the opportunity, attain any goal he sets his mind to, achieve any accomplishment he can develop the skills for, regardless of the color of his skin. That’s an amazing thing to get to witness, and that’s why it was the best moment of my entire week.